I’ve been feeling like I can’t catch up. Every time I think I’ve completed my list on Remember the Milk, I have five more items to add. Bear in mind – I’m not complaining. The fact is that more educators than ever before are looking to learn how to improve teaching and learning using technology. But there are only so many hours in the day and days in the week. Building personal and professional learning networks takes time. It’s been a long week. It just started raining about 10 minutes ago. I have 25 minutes left to work until my children come home from school. But I wanted to end my day, and my week, thinking about three things that make my job so enjoyable and rewarding. Betty Napoli from Galloway Township Public Schools sent me this diagram earlier this week. Betty was enrolled in my iPods in Education workshop this past summer. Her district has purchased 3 iPod Learning Labs with 60 iPod Classics and 60 Voice Recorders. She put together this plan based on her knowledge of the technology, what she gained from the workshop, and the discussion that she and I had with her colleagues after the session ended. An administrator from a different district hired me to teach an after school series on using collaborative docs with her staff. She had never used Google Docs before, so when I typed up the session descriptions for her, I typed them in a – you guesssed it – Google Doc. She has a Google Account now and she has since edited the shared document. And, finally, the last thing that I want to think about before I go into the weekend. A weekend that will be spent going to two birthday parties, shopping for ballet slippers and tap shoes, working on our Everyday Math books, trying to finish a grant I’m writing, spending time with my husband and two girls, maybe relaxing a bit is this. I have a PLN that listens and responds. I share what I learn with them and they share with me. …but I am excited, nervous and some what overwhelmed. Having tried setting up a network of colleagues through my Google account (Sparks)last year, I am looking forward to networking, sharing, helping, learning. I look forward to sharing with you Mike a great exchange of ideas with you Mike! You aren’t kidding! Time to network is so scarce. I grab it whenever I can and hold it tight. “Time is like a handful of sand- the tighter you grasp it, the faster it runs through your fingers. This quote – so true. Wish I knew who said it. In taking a moment to share how overwhelmed you are feeling, you have just shared a way to process uses for technology and develop a plan for action to keep a teacher/district using new technology focused. I appreciate your sharing the graphic organizer. This is a great way for someone attending a workshop and planning to use what they have learned to make sure that he/she does something with the information. It also reminds me of what you can do with an iPod. 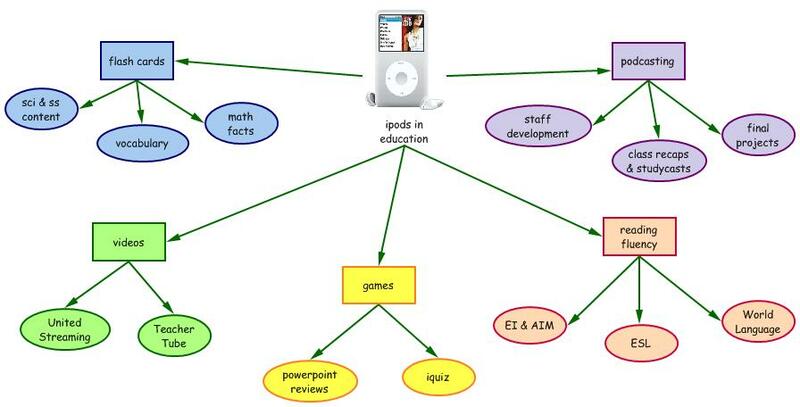 Even though her plan fits on one page, this is plenty to keep a school busy and make good use of purchased technology. I feel your pain. It is so hard sometimes keeping up with family and the learning. I always say if I didn’t have to sleep I might have it made. I am trying to keep a balance this year though. I can sometimes get sucked into the network. I need to balance time spent learning and time spent on just living life. Setting aside time to just relax is a must too. @Nhill – I agree. It’s important to relax and take time for your personal life. After sitting on it for a bit, I’ve decided one course of action for me might be to have one goal a night. Tonight it’s going to be prepping for my workshop tomorrow. Of course right now I’m commenting here, but you know what I mean. I’m not going to get side tracked with another project. Tonight will be devoted just to tomorrow’s session and no other projects.